Sleep is a necessary commodity; it is estimated that we need to sleep about a third of our lives for better health. And yet, in today’s overfilled and hectic times, many people suffer from lack of sleep. In fact, it is estimated that about 50 to 70 million American adults suffer from a sleep disorder that manifests itself in a lack of restful sleep. As sleep deprivation becomes more severe and chronic, symptoms of sleep deprivation can become life threatening. While it is true that people vary in the amount of sleep they need, sleep deprivation can be defined as not getting enough restorative sleep so that the individual with sleep deprivation suffers from daytime sleepiness, a lack of concentration, poor memory and many other physical and mental disorders. The average amount of sleep a person can get is about 7-9 hours but many people try to cut back on that so they can get more done during their waking hours. The end result is symptoms of sleep deprivation. A major study recently polled almost 75,000 individuals regarding their sleep habits. They found that about 35 percent of individuals get less than 7 hours of sleep per night. Half of all people report snoring, which can interfere with the quality of sleep; another 38 percent of people stated that they fell asleep unintentionally during the previous month. More than 4 percent of people indicated that they nodded off while driving within the previous month. Another national study on 10,000 people revealed that 37 percent of the people between 20 and 39 years slept less than 7 hours a night. Older people fared better, with 32 percent of older Americans reporting getting less than 7 hours of sleep per night. The amount of hours of sleep we need varies with age. 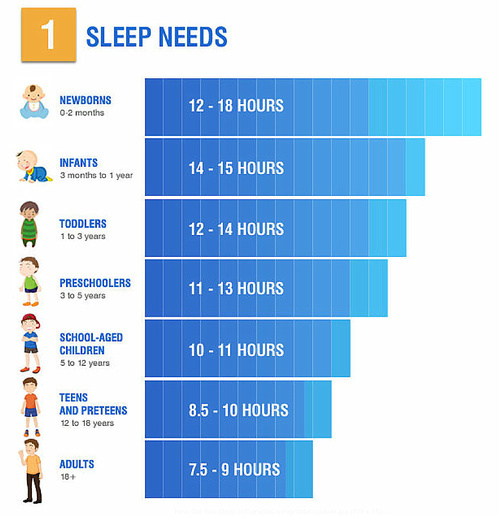 Kids under the age of 12 need about ten hours of sleep to function normally, while teens need 9-10 hours of sleep per night. Adults must get 7-9 hours of restful sleep each night In order to function maximally during the day. About a third of us fail to get that much sleep, making sleep deprivation a public epidemic. Did you know that some of the more serious accidents in the world were in part a problem of lack of sleep? Things like the 1986 Chernobyl nuclear meltdown and the accident at Three Mile Island in 1976 were related to operators not getting enough sleep. Approximately 100,000 automobile accidents were directly caused by sleep deprivation. Workplace injuries are often a direct result of not getting quality sleep. A lack of sleep cuts into your ability to concentrate, your ability to remember thing and your thinking. You suffer from deficits in problem solving, memorizing, and reasoning. You need your sleep to help solidify your memories of the day prior so, when you cram for a test and don’t get enough sleep, you may have done yourself some good by studying less and getting a better night’s sleep before the examination. You can suffer a higher risk of diseases like heart disease, high blood pressure, stroke and diabetes if you don’t get enough sleep. The actual mechanisms that link sleep and these diseases are not yet that clear. What is known is that 90 percent of people who suffer from insomnia also suffer from at least one other health problem, such as those just listed. A lack of sleep can contribute to developing depression. In fact, one study involving 10,000 individuals indicated that sleep deprived people were five times more likely to develop depression when compared to those who got enough sleep. People with depression are more likely to report sleeping less than 6 hours per night. As depression can cause insomnia, the combination of the two problems sets up a negative cycle of more depression and more sleep deprivation. People with sleep deprivation suffer from low levels of growth hormone, which is released into the bloodstream when we are deeply sleeping. This can affect children who do not get enough sleep as well as adults, who need growth hormone for body restoration. Sleep deprivation contributes to having a poor memory. Because memories are solidified in the brain during sleep, we lose those memories not consolidated during our sleep time and we are more forgetful. A lack of sleep contributes to changes in the brain hormones that affect hunger and satiety so that people who sleep less than 6 hours per night have a 30 percent greater chance of suffering from obesity. A lack of sleep also seems to contribute to cravings for foods that are high in fat and high in carbohydrates which can lead to a weight gain. A landmark British study of more than 10,000 people showed that people getting five hours of sleep a night had twice the risk of dying from any disease over a period of time. These sleep deprived people were compared with others who got 7 hours of sleep per night. Have a set schedule where you go to bed and wake up at the same time every day. Your body will become used to the habit, and you’ll sleep longer and more restfully. Don’t eat a large meal before going to sleep. The key idea is to give sleep a high priority in your life. More sleep equals a better feeling of wellbeing and better health overall.